Description: Clump-forming herb, lacking a pseudostem. Leaves several, basal, ± spreading, broad-linear, 30–80 cm long, 1–5 cm wide, margins ± rough. 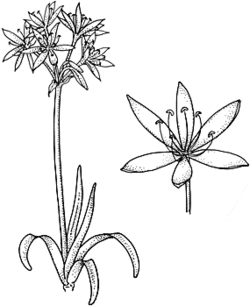 Scape 10–75 cm high; umbel 5–16-flowered; bracts membranous to papery, to 16 cm long; pedicels 1.5–7 cm long. Flowers with heavy scent. Perianth tube 2–11 cm long; lobes elliptic to oblanceolate, 3–10 cm long, spreading, white to yellowish. Stamens with filaments 2.5–6.5 cm long, pink or purple; anthers 4–12 mm long, ± crescent-shaped, yellow. Beak on ovary absent or to 10 mm long. Distribution and occurrence: Grows near inland rivers, often along sandy floodways; west from Wellington and Tamworth districts. This probably includes more than one taxon; for example, there are yellow-flowered plants from inland South Australia that are now considered to represent a separate taxon C. luteolum Traub & Hann. ex Traub. There is apparent morphological intergrading with C. angustifolium in Queensland fide Hewson, Fl. Australia 45: 373 (1987).